Exclusive 8, 5 or 3 Easy Payments on Shure BLX 288PG58 Dual Handheld Wireless Microphone System only at AMS! Free 2 Day Shipping and Free Extended Warranty. Call our Gear Experts at 800-319-9043 for expert advice! 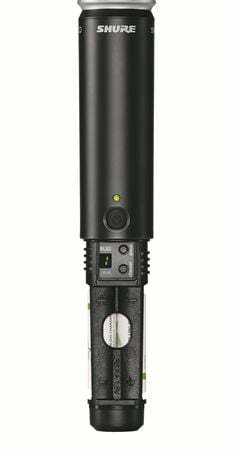 The Shure BLX288/PG58 Dual-Channel Handheld Wireless System puts professional-grade wireless vocals well within reach of performers. Part of Shure’s popular BLX family of wireless systems, the Shure BLX288/PG58 Dual-Channel Handheld Wireless System delivers pure, crisp sound night after night at a price that won’t put a strain on your finances. The system starts with a pair of tuned PG58 handheld vocal microphones, each featuring an integrated cardioid dynamic microphone capsule based on Shure’s legendary SM58 design. With an available -10 dB of gain attenuation, the PG58 handheld wireless microphones deliver crystal-clear, distortion-free sound quality that’s perfect for a variety of performance styles. 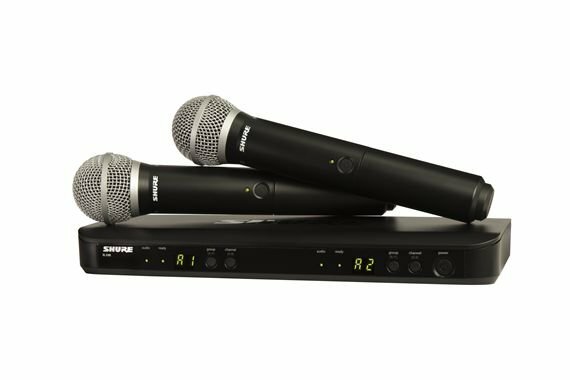 From onstage lead and backup vocals to karaoke, from spoken word to worship applications, the Shure BLX288/PG58 Dual-Channel Handheld Wireless System is the right choice for just about any vocal application. Each PG58 microphone is constructed with a road-tested ABS polymer chassis and frame for rugged, lightweight performance and they’re designed for maximum efficiency. Just pop in a pair of AA batteries and enjoy 14 hours of continuous operation. A convenient On/Off switch is located on the microphone grip, along with a two-color LED that indicates operational status and battery strength. The transmitter’s generous 300’ line-of-sight range allows for untethered showmanship with no cables to snag or trip over and no faulty jacks to fuss with. The BLX88 dual-channel wireless receiver’s sleek front panel is designed with adjustable gain control and a clear LED display that glows green at normal levels and red when clipping for easy, on-the-fly monitoring. The back panel is simply laid-out and clearly labeled for plug-and-play functionality. The sturdy XLR and 1/4” outputs allow for instant compatibility with nearly any PA system, and the BLX88 handles up to 12 compatible systems per band. Set to Shure's H9 band and operating at frequencies between 512 to 542 MHz, the Shure BLX288/PG58 Dual-Channel Handheld Wireless System is easy to set up and adjust. True to its name, the one-touch QuickScan frequency selection feature quickly finds and locks in the best available open frequency for minimal interference, while the BLX88’s microprocessor-controlled internal antenna ensures a steady signal with significantly reduced risk of dropouts. Unboxed, the Shure BLX288/PG58 Dual-Channel Handheld Wireless System includes two PG58 handheld transmitters, a BLX88 dual-channel receiver, two microphone clips, a power supply, four AA batteries, and a User Guide. Every Shure product benefits from nearly 85 years of microphone design expertise and decades of wireless technology development. The sleek, compact BLX288/PG58 Dual-Channel Handheld Wireless System is no exception. Rather, it’s a quite worthy and surprisingly affordable addition to Shure’s proud lineage. Bought these for our church, we love them!! This past Saturday I used my purchase and it was worth the investment.Once again American Music Supply as won me over. Easy setup and they sound really awesome!!!! This product is awesome and we'll worth the price. Will suggest it to any individual who needs a wireless system. Awesome!!! After spending countless amount of money on wireless microphones, I finally went ahead and spent the necessary money and I am pleased. Thank you Shure! Very good deal. It came as described.there was a mistake on my order but customer service was on point. It was not hard to connect and shure quality cn never disapoint. I really recommend it. Great product,Would recommend to other churches. I recommend this mic to anyone looking for a quality mic. Great product, I love the clarity of it and no feedback which is a plus.